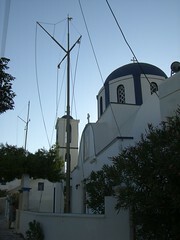 On the small island of koufounissi they’ve rigged St. Georges church. One highlight of my Greek holiday involved sitting on this church wall in the early evening listening to the ceremony songs waft through the open doors, children wobble in and out of the church, two old ladies greeting attendees and shepharding the children, watching the passers-by cross themselves as the sunset gathered on the horizon. This scribble was published on Sunday, August 31st, 2008. You can follow any banter on this scribble with the RSS 2.0 feed. You can share your inspired musings after typing the anti spam word near the bottom of the page. But no Pinging because its too naughty.